A good day traveling yesterday from Oakland, CA to Charlotte, NC. I think I’ve been ready for some time away from the office for a while now. Sprint was nice enough to lend me a Galaxy Tab a few months ago to try out which I’ve been loving. I truthfully haven’t fully understood the tablet trend because I take my laptop wherever I go and love having a full keyboard. That is until I traveled for 7 hours on a cramped cross country flight. The Galaxy Tab performed like a champ, the battery lasted the entire day with juice to spare. I loaded it up with a bunch of videos I’ve tried to find time to watch but life doesn’t allow for much time these days. I don’t mind being busy but just want to feel like I’m in control of life and that life isn’t controlling me which hasn’t been the case. So anyway the tablet was a champ and I’m now a big believer but don’t know if I am ready to break down and buy one yet. Not too much drama traveling yesterday either which is very unusual for me. Christina and I joke that we would be the worst couple (or the most hilarious) on the Amazing Race. Almost every trip I forget something major but so far nothing too significant. I’ve started making myself travel checklists which has seemed to help. 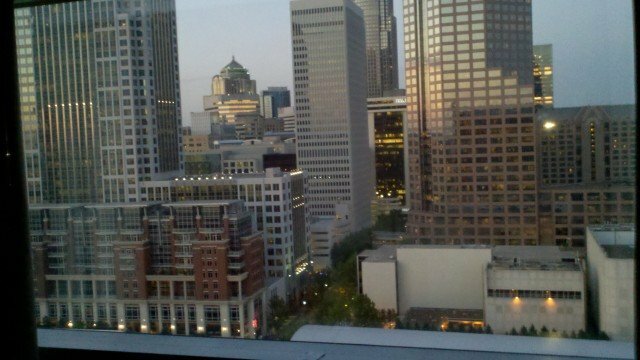 The photo above is from my room on the 22nd floor of the Westin in downtown Charlotte. The best tip I can give anyone traveling who is staying in a hotel is to be extra nice to the person checking you in. I’ve also learned to ask for what you want, it never hurts to ask. That is all for now.